Hit up The Rouge on Purna Das Road for the best (and light) sandwiches, desserts and beverages. And it's a great place for breakfast after a morning run at the lakes. Hey people of South Kolkata, we have some good news. 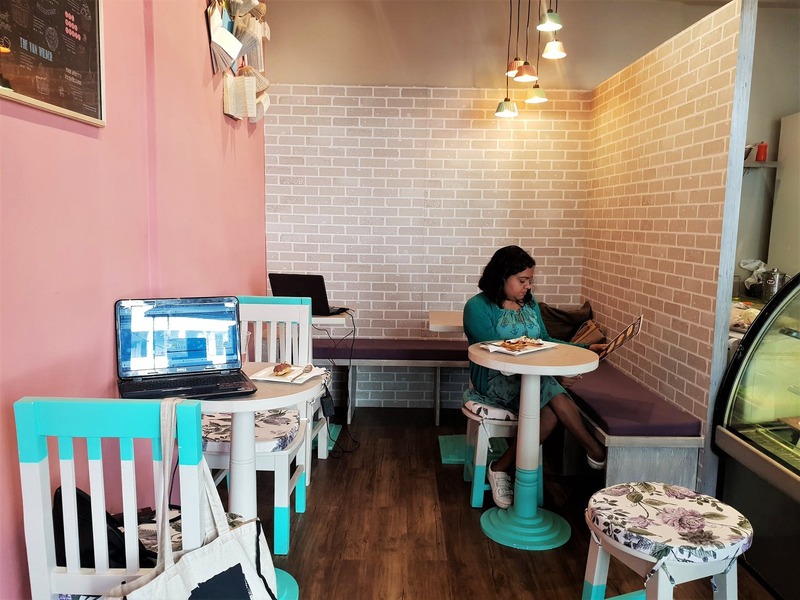 One of our fave dessert places, The Rouge, has opened an outlet on Purna Das Road (close to Wise Owl cafe). So no more going all the way to noisy and chaotic AJC Bose Road-Park Circus area. You can have your fill of their excellent macarons and cupcakes in a nice leafy lane. The cosy little space, done up in pastels, has a few seating arrangements inside and a couple outside. The Rouge is known for their cupcakes, eclairs anad macarons. The cupcakes come in the regular size and mini (for those who can't stomach too much whipped cream, these are a good option). Do not miss their famed red velvet and cream cheese one (aptly called ‘Rouge’). Choose from hazelnut, coffee and red velvet flavours. The window displays different varieties of tarts, brownies and cookies. We had the frangipani tart and it was light, fragrant, and topped with thin slices of almonds. This outlet's menu also lists open sandwiches - crusty oval slices of bread with different toppings. We had two of these - the Miss Polka which had thin slices of gouda and pomegranate (with balsamic reduction and basil leaves). The sharpness of the cheese complimented the light touch of the sweet and sour from the dressing really well. The second sandwich we picked was The Grandpa - a classic chicken mash with toasted melon seeds on top. This too got a thumbs-up. If you are coming here after a morning run, try The Elvis sandwich with a topping of peanut butter, banana and chia seeds. Wash it all down with a cup of coffee, tea or shake - they have a pretty huge range of beverages. Nothing we had here was heavy or overwhelming, everything was light, full of flavour and with quality ingredients. One big factor in their favour is that it opens before anyone else in the area does - at 9:30am. In fact , we trudged through lanes looking for an open cafe (at 11am) and found them all shut! So you can come here after a morning run at the lakes on Sundays! It would be great to have Wi-Fi here - we would love to work out of a space like this! They do a range of customised cakes for birthdays, weddings and any other special occasion - even elaborate three and four-tiered ones.